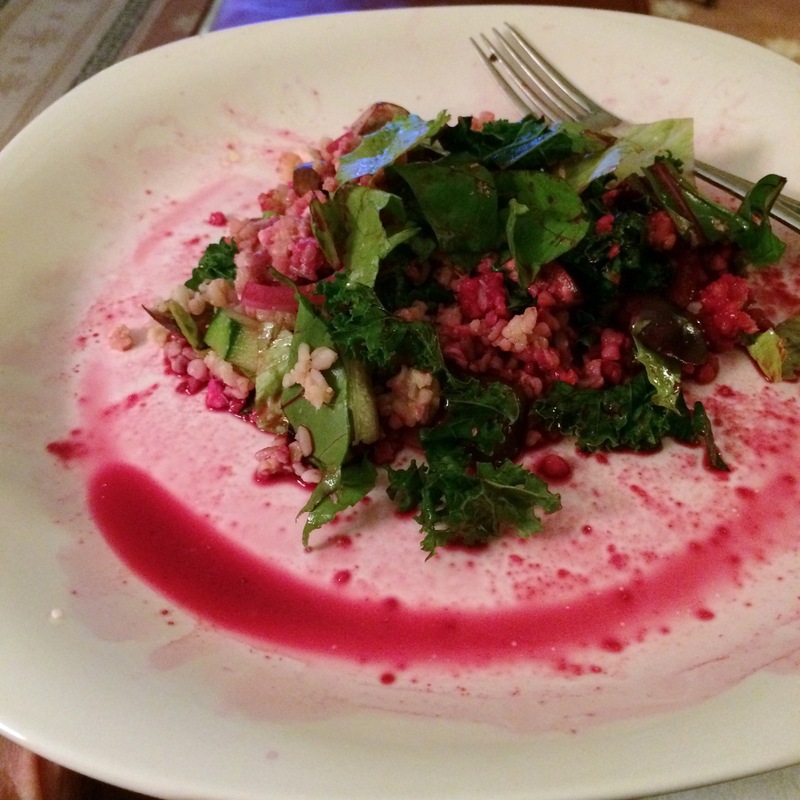 In the photo, I’m two-thirds into my salad meal and you can see the beet juice pooling on the plate. Let me tell you about adding beets to your salad. I love to add beets to my version of a nutrition packed salad. The beet juice bleeds its color on the vegetables, which is fun. They also add a slight sweet element to the salad. To prepare the beets, cut off the greens and store them as a salad green. Cook the beets for an hour at 350 degrees. To do this, cut off the roots and rinse them. Place them in a small baking pan lined in aluminum foil. Pull the foil over the beets and seal it. After they are baked, let the beets cool and refrigerate for a night. When you are ready to serve them, peel off the outer skin and cut off the lower root section. You can cut them into chunks and add to the top of your salad for color, sweetness and added nutrition. Just be aware they will bleed red on you. For this salad I started with romaine lettuce. I added kale, beet greens (you can eat them too), portobello mushrooms, sliced cucumber, onion, grape tomatoes, Kalamata olives, brown rice, ground flax seed and a little Feta cheese. I cooked the kale and mushrooms in the microwave for 20 seconds. Cooking the kale softens it and helps release the nutrients (from what I’ve read). Otherwise kale is like eating cardboard. I have also read that mushrooms contain a small amount of toxicity which is released by cooking. So I zap them in the microwave for 20 seconds. This leaves the mushrooms full bodied, yet soft and juicy. I often top my salads with vinegar, olive oil and garlic powder. Sometimes I also add dried oregano. This makes a very full salad meal which is very nutritious. The flax seed and dark greens give you plenty of protein. You can skip the rice if you want to cut the calories more. It takes a long time to eat a large salad like this. Take the time to enjoy it. The salad is the meal. If you haven’t tried adding beets, give it a try. I think you will like their addition to your salad.